In an era where Whole Foods has been acquired by Amazon and Target releases its own line of wines, we’re really not that surprised to see the lines between mega retailers and specialty stores continue to blur. Walmart — the nation's largest food retailer — is even branching out into the agro-business, partnering with Bayer to create a designer melon. The final result is the Sweet Spark, a cantaloupe that tastes nearly twice as sweet as the average melon available during cooler months. Walmart sells several melon varieties year-round. "Walmart sells nearly 10 times as many cantaloupes in June as we do in December," Molly Blakeman, a spokeswoman for Walmart, tells TODAY over email. "For the past 15 years, winter cantaloupes have been grown in Central America and shipped by ocean vessel to the United States." In previous years, Blakeman says, farmers working in conjunction with seed breeders, focused on growing melons that would survive the two week trip and still have enough shelf life left for the customer. "Problem is, the industry forgot about flavor along the way," Blakeman says. "We had cantaloupes that were firm and looked nice on the shelf, but they didn’t really taste like cantaloupes." And something that doesn’t taste good doesn’t sell so well. So, Blakeman says, Walmart collaborated with seed companies from around the world to grow a new, highly-flavorful melon that could be harvested for winter consumption. Traditionally, all fruits have a season — there are parts of the year where specific fruits just taste better. 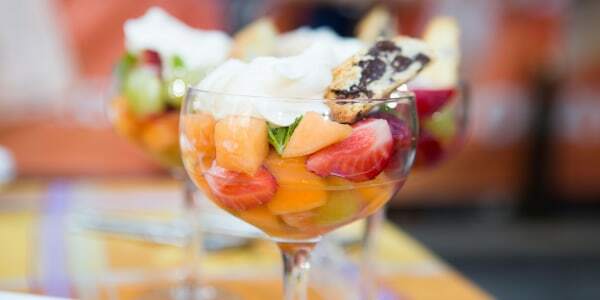 For cantaloupe, like many other fruits including watermelon and strawberries, that’s summer. That’s usually when you’ll find the melon at its peak sweetness, and it's the ideal time to include them in summer salads and smoothies. After working with Bayer to create a better tasting fruit, Walmart revealed the Sweet Spark — which tastes "40 percent sweeter" than a melon you'd usually find in winter — in December of last year at 200 stores. But it's not available to consumers nationwide just yet. Designer produce is nothing new to the fruit industry, though. Remember those Cotton Candy grapes? And while this may be the first time Walmart has jumped on the designer fruit train, they've been getting pretty creative lately with their food. Remember those fascinating fruit punch pickles? If sticking to more natural sweets is more your style, the super sweet Sweet Spark cantaloupes from Walmart can be found in store locations nationwide beginning in December. Editor's note: An earlier version of this article stated Walmart revealed the Sweet Spark in June but it was first released to a limited number of stores in Dec. 2016.